Bethesda have today announced that a direct follow up to 2016's DOOM, titled DOOM Eternal is currently in development. The publisher has promised double the number of demons and a whole lot more action. Unfortunately for Switch owners, the platforms this game will be released on have not yet been revealed, and so begins speculation about whether or not the title will come to Nintendo's latest device like the original game. Fingers crossed. A full gameplay reveal of DOOM Eternal will be at Quakecon this August. Okay there HAS to be a Switch version. I mean....right? It runs on the same engine. It SHOULD be ported. Would love to see this on Switch! best announcement so far at Bethesda's E3. It's gonna be for every platform except Switch. Calling it now. The live stream of the Bethesda presentation should have been shown on NL. As 3rd party's go on Switch they are as relevant as Ubisoft are, probably even more so. If it runs on the same engine as the first game, it seems probable that we will get a Switch port. Though 5 bucks says it will release later than the PS4 and Xbone versions. Not expecting it on Switch. Would be nice though! I think a Switch version is a given at this point. I very much doubt that this will use a new engine, and I can imagine that it will recycle a lot of assets from the previous game, which isn't so bad considering that DOOM II and Final DOOM recycled the DOOM 1993 engine, and those games are FAR less sophisticated than DOOM 2016. My only concern is whether or not they will be using 32GB cartridges this time. Bethesda p'ed all over my hopes for Wolfenstein II by skimping on the cartridge, so I refuse to buy that unless I can grab it for $20 or so (it's more than they deserve for their crappy handling of the Switch version). Normally I would opt to skip it altogether, but I will probably cave in at some point, but it won't be for a good long while. I would have happily paid full price for a proper release otherwise, PLUS I would have bought the censored German/Austrian version as well. At the moment, I intend to buy neither, so Bethesda are losing two full-priced sales from me. I'll probably grab DOOM Eternal regardless, but I can't justify paying up for a partial-cartridge release. It's such a despicable practice that I hope never to indulge, and the last DOOM already exploited my goodwill as far as I was willing to let them (and yet Iwould still double dip on a 32GB cartridge version if they were to issue one). @Heavyarms55 That'd be completely fine with me. A late port is better than no port at all. Surely we contributed some good numbers?! I bought it day one, and it’s one of my fav Switch games. Bethesda must hold us in some positive regard, given their support. Regardless of if this comes to Switch, this is awesome! The first modern take on Doom was sooooo good. I have nothing but high expectations for this one. I expect this game to come to Switch 9-12 months after its release on PS4/XBO/PC. Unless this game changes game engines from the 2016 Doom, I'd be surprised if it wasn't Switch-bound, even if not day-and-date with the other versions. It better come to Switch, I didn't buy Doom Switch for nothing. 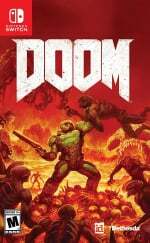 Doom had many history on Nintendo platforms and this will be the second time a Doom sequel reach the same Nintendo platform (first time being Doom I & II for GBA) if it happen. Doom Eternal would be great to have on Switch. I, for one, would almost rather have a new Quake game with a great single-player campaign. What?! It's not confirmed for Switch? Nintendoomed! Eternally Nintendoomed! Doooom babeeeeee! That's what I was waiting for! Oh, and Wolfenstein Young Blood has me pretty hyped too! See, this is a lot more likely than Fallout 76 to have a Switch version. Or, at least it feels like it is. Wow! I love doom it was the first fps i ever played! 😀 So hyped!!! Same engine, I'm sure they have plans for a Switch version. I suppose depending on the last ones sales. If this game is in fact being ported to the Switch a day and date version of the game would be killer for Nintendo. I hope they have learned enough from developing DOOM and Wolfenstein 2 so that they can make it happen. As much as I loved Doom on Switch, I don’t see this happening. Tonight’s presentation was a sobering reminder that even though Bethesda has supported Switch with a few games, it is still on the low end of the totem pole. Even friggin’ PSVR is getting better support! I must say, there was shockingly very little information shown for pretty much all the of the new Bethesda announcements outside of Rage 2 and Fallout 76 (and updates/expansions to older games). Starfield and TES VI are cool...I guess. Fallout 76 is nothing like any of the previous Fallout games; it honestly looks like a "Pokemon Let's Go" version of Fallout. I'm glad Nintendo is going to focus on 2018 games at their E3 Direct and not tease two next generation titles that might come in 2021 at the earliest. I wouldn't rule a Switch version out, but I think the odds are, slightly, stacked against it. If it does happen, it certainly won't happen day and date. I'd love to be proven wrong of course. Guys. I get it. I was once hopeful as well. But let's be honest, man. This game is not coming to switch. Just accept that switch is the new wii, in that, it's the perfect secondary console. Ironically, the wii u still remains more feature full than switch to this day. Classic Nintendo. This will be fun to play on Nintendo console... in 8 years. @Heavyarms55 Didn't Bethesda recently confirm that all new titles after wolfenstein 2 would be universal release on all platforms? Assuming Doom comes to Switch I would think that would fall into that category. Maybe this might come but I'll wait and see. As of right now mobiles are safe bet. Call me crazy I just see third party evaporating like the Wii. Good at the beginning but sad at the end. Didn't you hear? It will be released on Switch as a free-to-start game called Doom Puzzle Blast. Use your match 3 skills to defeat Satan's hordes. Buying this on switch would be an absolute crime. 30fps and below, 720p resolution at best and other graphical oditties topped with a blurry filter. The only appealing addition aside from portability which i personally dont care for are gyro controls. Either way I'd rather play this on the Sony VR with move pointer controls. Switch or ditch. It will probably be awesome, on whatever system it eventually arrives, but I only play on my Switch still. As with every generation of video games, my Playstation ends up being a dvd-bluray-player with an occasional game, while my Nintendo devices get the games. The whole Bethesda conference was underwhelming. Mobile games, whatever 76 is, announcements without dates and full-on vapourware trailers. At least it wasn't as bad as EAs I suppose. Microsoft was very good, so it looks like it's down to the platform holders to save E3 this year. I'm happy with the Doom we have on Switch. Will likely save this one for PC. SWEEET. Will definitely be a day 1 if it comes to Switch. Currently at 50:50 too about it coming to Switch. It may also be slightly delayed. Really all depends on sales figures of the original Doom or they may even wait for early sales of Wolfenstein 2 (which would mean a later release). Teasing games that won't even be released in this console cycle is not the way to "win" E3. If Nintendo took the Bethesda approach and announced Metroid Prime 5 + Zelda Breath of the Wild 2 at this year's E3 and did little else, then I'd be pretty bummed. Other systems first, then ported to Switch later. And rightly so. They even flagged up Starfield as 'next gen'. As it is Bethesda took an unusual approach and tried to actively troll the Fallout and TES fanbases. I'm pulling for this for the Switch. The original new Doom was great on it! DOOM on Switch is so good, I downloaded it as soon as I got my Switch some months ago and I'm still playing it. Fantastic stuff. Or your first console if you do not want AAA multi player games,or have hours and hours of time to put into games. If this and 76 are announced for Switch, we're sitting pretty good. I think this will likely be a late arrival on Switch. Like most here it won't come to switch, all the others yes... Maybe switch will get it in 2019-20???? The big takeaway for me on that conference was that they were working on a bunch of stuff, but not much for this year and not much detail to give. Hopefully there will be more announcements next year. Of all the games announced at Bethesda's conference, this one seems the most likely to see a Switch release. Rage 2 is what caught my eye though. It's really hard to say if this will come to Switch. Doom in normal mode was pretty great, but struggled in the harder modes with a lot going on. Either way, I'm sure Panic Button would be up to the challenge. We'll see, I hope Switch gets it. @gatorboi352 "Just accept that Switch is the new wii"
then we'll have a better understanding that Switch isn't the new Wii, it's the New New 3DS. All the 3rd party companies that want portable versions of their games will port them to Switch, but ti won't be getting a lot of PS5/X2 games similar to their home counterparts. Even if New Switch releases around the same time it still wont' be up to the task, and Switch 2 is too far away. It's why Switch gets FIFA 19 - b/c there is still a PS360 version coming - but not Madden which hasn't had a PS360 version since 2016 and that was half the PS4X1 game. Looking at Switch as Wii is defeatist, Switch is the last, and most powerful, portable standing. TV out is a bonus. That will be the accepted mindset starting in 2020. This E3 it's starting to set in w/ a lot of denial, next year will be the anger, 2020 the acceptance. NintenDooMed if Switch doesn't get this. @gatorboi352 its coming to switch man just watch. Nintendo wishes it was the new Wii! I'm with @rjejr on this. Switch is the new 3DS. Nintendo thinks the new DS, but new 3DS is more likely. And that's the right thing to do. No point getting into the x86 power race and wielding all the same AAA shooters that people can play on multiple other systems. Nintendos strengths are the portable market, which they now have to themselves, and their own games, which will now be gathered on one system. It's designed to hoover up the 3DS, Vita and Wii U userbases. Those lamenting the lack of western AAA games bought the wrong system. Those thinking their absence will make any difference to whether Switch is a success are wrong. This game will probably come later after the other console and PC release for compression purposes. @Prizm hate to burst your bubble but it looks like it will be released on the next Nintendo console 3-4 years after its mobile release. BTW Wolfenstein Youngblood is available for pre-order on Gamestop's website. This is far from a confirmation that the game is coming to the Switch, but it makes the possibility far more likely.